Founded in 1987, Growers Express, LLC (GE) is a farmer-owned grower, packer and shipper of premium-quality fresh vegetables who grow over 30 vegetable items year round for nationwide distribution. For over three decades, our family of growers has been committed to the adherence of rigorous agricultural standards to ensure all of our vegetables are the most wholesome and highest quality fresh vegetables available. 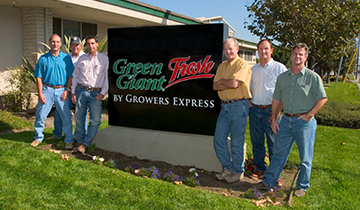 Located in Salinas, CA, also referred to as the “salad bowl of the world,” in 1995, GE became a licensed partner of Green Giant™ Fresh—the exclusive fresh produce arm of the iconic Green Giant® brand. Grower Express provides a full line of commodity and value-added vegetable blends, including traditional favorites, as well as popular on-trend items. Each product is planted and cultivated using traditional farming methods, combined with the latest technology in harvesting, cooling and packing. Additionally, our premium packaging offers the best protection of—and extended shelf life for—our freshly harvested products. We take great care to harvest and pack our products to ensure our customers receive the freshest quality products for their shoppers. Keeping our finger on the pulse of the consumer, we are continually innovating nutritious, time-saving and easy to use unique blends and mixes, many of which can be steamed right in their package. From delicious and nutritious meal ingredients and side dishes, to special occasion culinary masterpieces and everyday meal inspirations, our Growers Express and Green Giant™ Fresh vegetables bring consistent quality and flavor to every dish, all year round. That’s quality you can taste, from a brand you can trust. 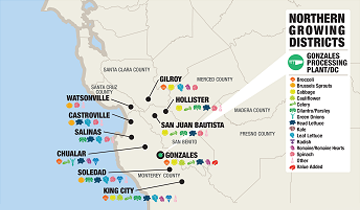 Distribution Centers: Salinas, Oxnard, Yuma & Maine. Click here to view map (of West Coast locations). Our full line of premium commodity vegetables includes 30+ products and ranges from broccoli, cauliflower, cabbage and squash to Brussels sprouts, celery, radishes and a wide variety of head and whole leaf lettuce products. As an industry-leading company with a focus on innovation we’ve earned many first-to-market claims, including on our Cauliflower Crumbles® chopped cauliflower product. Keeping our finger on the pulse of food trends and consumer demand, we keep the needs of our consumers in mind with every new product we develop. 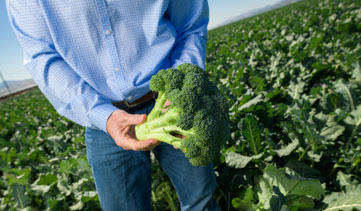 With innovation being paramount to us at Growers Express, our pioneering spirit has us regularly developing unique new vegetable blends, mixes and value-added products, as well as traditional favorites that time-starved consumers love. From a variety in flavor profiles, to ease of use, and versatility in ways to use our new products, many of our innovations come in zip-top packages and can be microwaved right in their pouches offering additional convenience. Sustainability is important to Growers Express. We work hard every day to provide our customers with premium quality fresh vegetables that are grown with minimal environmental impact. We are committed to reducing waste, limiting the use of precious resources, and fostering a culture of sustainability in all areas of our business–all of which continue to reduce our carbon footprint.